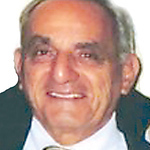 Salvatore L. Gineo, age 89, beloved husband of Patricia (Coughlin) Gineo, passed in Farmington, Conn., on Jan. 19, 2019. Sal was born on Jan. 30, 1929, in Hartford, to Giovanni and Sebastiana (Abramo) Gineo. He attended Bulkeley High School in Hartford and completed his education while serving in the United States Navy. During his Navy service, he was based on the USS Princeton and USS Vulcan. He was honorably discharged in 1949 and received the American Area Campaign Medal and WWII Victory Medal. He lived most of his life in New Britain, Conn.
Sal was an entrepreneur and a former partner in Euro-American Connections and Home Care. He also owned the Blue Lobster Restaurant in Berlin, Conn., for over 30 years. Sal attended church at Saint Francis of Assisi in New Britain. He was active in the Elks, Italian Political Club, and the Veterans of Foreign War. He enjoyed playing cards with his grandson and friends at the Italian Club. Sal was a talented winemaker and made wine with his son, grandchildren, and friends. He was an avid skier, who taught his children and grandchildren to love the sport. He loved being near the ocean and spent time at the beach in Old Lyme. Sal loved spending time on the water with his family and friends. He owned several boats throughout the years and passed his love for boating onto his children and grandchildren. Sal was a very generous man and always had time for others. Over his lifetime, he gave many people opportunities that would not have been available to them had they not met him. However, the achievement he was most proud of was the closely-knit family that he and his wife developed and nurtured over the years. He was always available to spoil his grandchildren. We were all fortunate to have him in our life. Sal is survived by his wife of 68 years, Patricia (Coughlin) of New Britain, children, and their spouses; Wayne and his wife, Ann Gineo, Donna and her husband, Dennis Goodrich, Gary Gineo, Linda and her husband, Bruce Larson, and Greg and his wife, Tammy Gineo. He is also survived by his 12 grandchildren, Keith, Greg, and Michael Goodrich, Thomas, and Jessica Larson, Brian, Elizabeth, and Laura Gineo, Jonathan Gineo, and Nicole Garcarz, Christopher, and Sarah Gineo. He also leaves the spouses of his grandchildren, twelve great-grandchildren, many friends, and extended family. Special thanks go to the UConn nurses and doctors on Medicine 3 and the staff at Arden Courts in Farmington, Conn. Caregivers, Regina, Jack, and Wendy provided much care over his final months. The nursing staff at Goodlagin also provided superior care. Donations may be made to the Alzheimer’s Association at act.alz.org. A time of visitation will be held on Thursday, Jan. 24, 2019, from 4-7 p.m. at the New Britain Memorial Donald D. Sagarino Funeral Home, 444 Farmington Ave., New Britain. Funeral services will begin Friday, Jan. 25, 2019, at 8:30 a.m. from the funeral home, followed by his funeral liturgy at 9:30 a.m. in St. Francis of Assisi Church, 1755 Stanley St., New Britain. Burial with military honors will follow in St. Mary Cemetery. For directions or online messages, please visit www.newbritainsagarino.com . Posted in New Britain Herald, on Tuesday, 22 January 2019 19:58. Updated: Tuesday, 22 January 2019 20:00.